To improve the Health Qigong level of European senior instructors, the International Health Qigong Federation and Chinese Health Qigong Association are organizing the 5th European Health Qigong Seminar for Senior Instructors and the 5th European Health Qigong Scientific Symposium. July 4th to July 7th, 2019 in Catania, Italy. 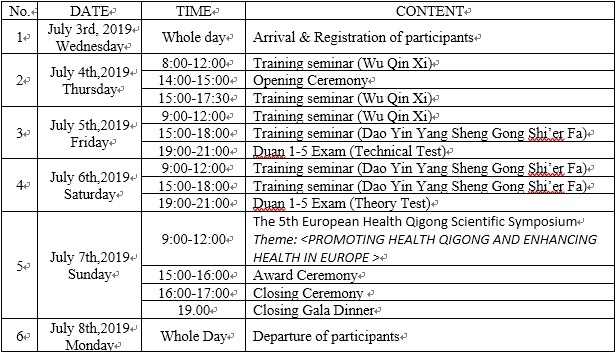 A. Seminar participants should be professional European Health Qigong instructors with official recommendation of formal Health Qigong organizations. IHQF and CHQA will confirm the accredited participants. B. Seminar participants enroll themselves by sending an email to the host, FIWuK for registration. When the relevant fees are paid, the registration is confirmed at the FIWuK. C. Only official hotels will be used. All participants that are accepted to attend the seminar are required to reside at the designated hotels. D. The Duan examination is optional. The applicants will enroll on line and pay according to the Duan Regulation. E. Health Qigong clothes and shoes are required during seminar. A. Participation Fee (Seminar and Symposium): 300.00 Euros per person (including one Wu Qin Xi book and One Shi’er Fa Book for for each participant). All participants are requested to pay the relevant participation fees in cash upon arrival, or prepay it with Accommodation Fee as required in VII.B. A valid stamped receipt shall be issued by FIWuK for all participants. B. Accommodation fee: There are Package fee for accommodation at different levels prescript in Annex 2. Any extra costs associated with rooms (mini-bar, swimming pool, etc.) shall be the responsibility of the individual. All participants are requested to pay the relevant accommodation fees (annex 2) by international bank transfer at the latest by May 19, 2019. Proof of which should be sent to the host by email and brought along to Catania for registration. C. FIWuK will assist those participants who will need an entry visa to Italy. An official invitation will be sent to each member/participant and information to apply for an entry visa to Italy. 8) Confirm and sign the above items. C. All participants are required to leave on July 8, 2019 (Exceptionally, the departure of participants may also be permitted no earlier than 18.00 on July 7, 2019). X. THE ORGANIZERS RESERVE THE RIGHT FOR FINAL INTERPRETATION OF THIS ANNOUNCEMENT.